CDSB has comprehensively reviewed the annual reports of the FTSE 350 listed companies in the report. 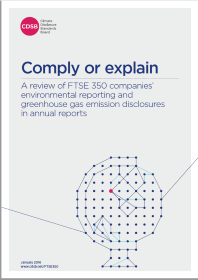 This review discusses the disclosure of environmental information in the annual reports of FTSE 350 companies following the implementation of mandatory greenhouse gas reporting in the UK (updates to the Companies Act 2006). Comply or explain focuses on comparative sector analysis and uses illustrative examples to provide evidence of current practice following the policy revision. The report proposes steps that could be taken by regulators to enhance the enabling environment for disclosure. It was reviewed by Oxford University’s Saïd Business School, and by members of CDSB’s Technical Working Group.